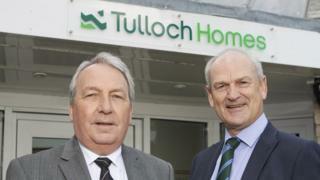 Image caption Keith Loades bho Chomann na Camanachd is Seòras Friseal aig Tulloch Homes. Dh'innis Comann na Camanachd gu bheil iad air tighinn gu aonta leis a' chompanaidh Tulloch gus an taic aca do Chupa na Camanachd a leudachadh. Bha Tulloch air taic a chumail ri Cupa na Camanachd san dà bhliadhna a chaidh, is mairidh an t-aonta ùr seo ceithir bliadhna eile. Bidh an t-aonta na thogail dhan chomann is seusan ùr nam fear gus tòiseachadh Disathairne. Bha buillean ann dhaibh anns na seachdainean mu dheireadh is Loch Abar a' tarraing na dàrna sgioba aca, Inbhir Nis a' co-dhùnadh a dhol sìos lìog, is Srath Chura an uairsin a' tarraing a-mach às na lìogaichean gu tur. Thuirt àrd-stiùiriche Tulloch, Seòras Friseal, a bhuannaich Cupa na Camanachd e fhèin ochd tursan mar chluicheadair le Bail' Ùr an t-Slèibh, gu bheil iad air an dòigh an t-aonta le Comann na Camanachd a leudachadh. "Tha sinn a' creidsinn gu bheil an taic a tha sinn a' toirt seachad na buannachd dha na clubaichean iomain a tha tric aig cridhe nan coimhearsnachdan beaga dùthchail anns a bheil iad stèidhichte", thuirt Mgr Friseal. "Tha àite fìor chudromach aig an spòrs a thaobh daoine a thoirt còmhla ann am bailtean iomallach", thuirt e.
Aig an aon àm, dhearbh Comann na Camanachd gur ann aig an Àird sa Ghearasdan a bhios cuairt dheireannach Chupa na Camanachd am-bliadhna. Thèid an geama air adhart Disathairne an 14mh den t-Sultain. B' e 2016 an turas mu dheireadh a bha a' chuairt dheireannach sa Ghearasdan is Bail' Ùr an t-Slèibh a' soirbheachadh 1-0 an aghaidh Camanachd an Òbain. Bidh am Bail' Ùr am-bliadhna ag amas air a' chupa a bhuannachadh airson an ceathramh turais ann an sreath.